July | 2012 | What Next? Last week while going for a walk in Winnipeg’s Exchange District neighborhood I found the GoodWill Store on Princess Street. 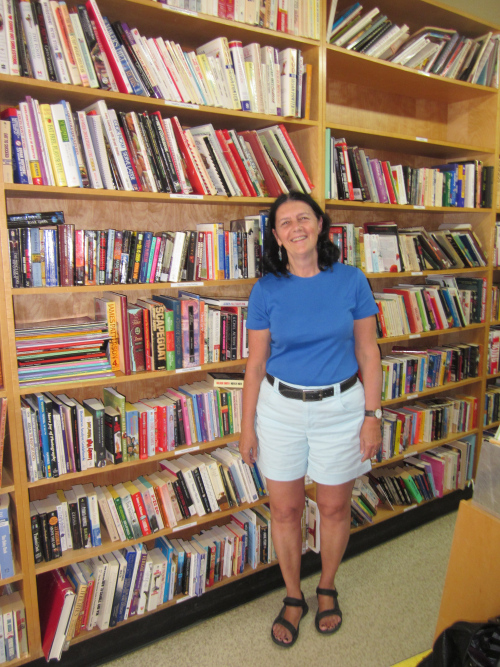 People donate clothing, books, appliances, furniture, dishes and other things they don’t want to the store and the GoodWill sells them, giving their profits to charity. The GoodWill was a place of wonder and delight for me as a child and I couldn’t resist going inside to see if it was as I had remembered it. I am sure the store has changed in the last 45 years but one thing hadn’t changed. 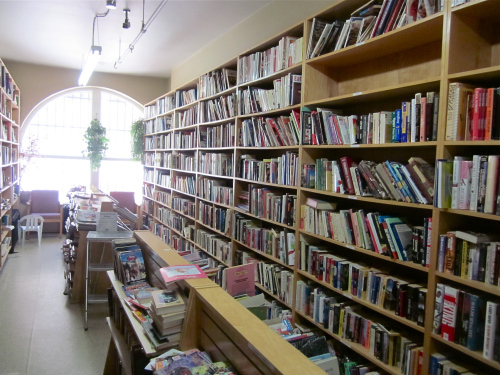 On the far wall just where they had always been, were rows and rows and rows of books from the floor to the ceiling. The shelves of the Good Will Store were one of my main sources for reading material when I was a child. We lived in Steinbach which didn’t have a public library till 1973, the year I turned twenty. Our church didn’t have a library yet, in fact we didn’t even have a building. We met for services in a school basement. The old Kornelson School where I first attended classes in Steinbach didn’t have a library either. My parents couldn’t afford to buy me new books all the time and Steinbach didn’t have a book store. 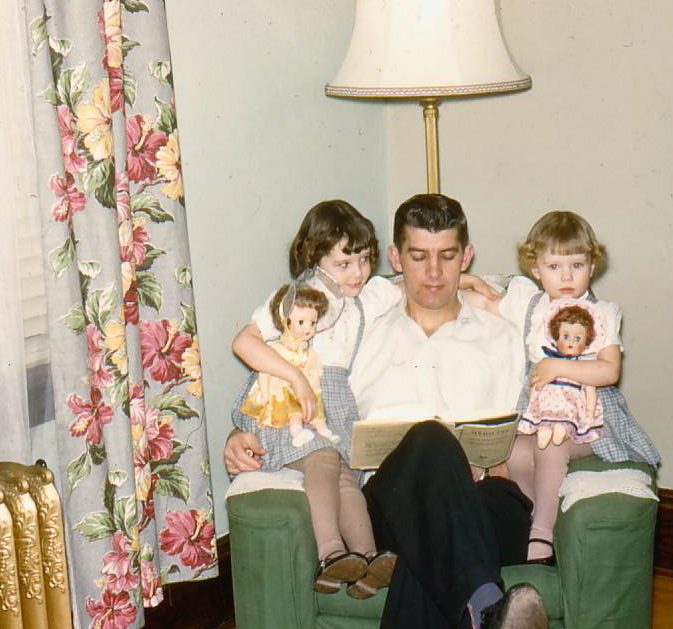 Perhaps because I had been read to often when I was a child, I grew up loving books and read voraciously. On family trips my Mom would tell me to get my nose out of my book and look at the scenery. Here I am setting off for my first day of school with a book in hand. I could read before I started grade one. 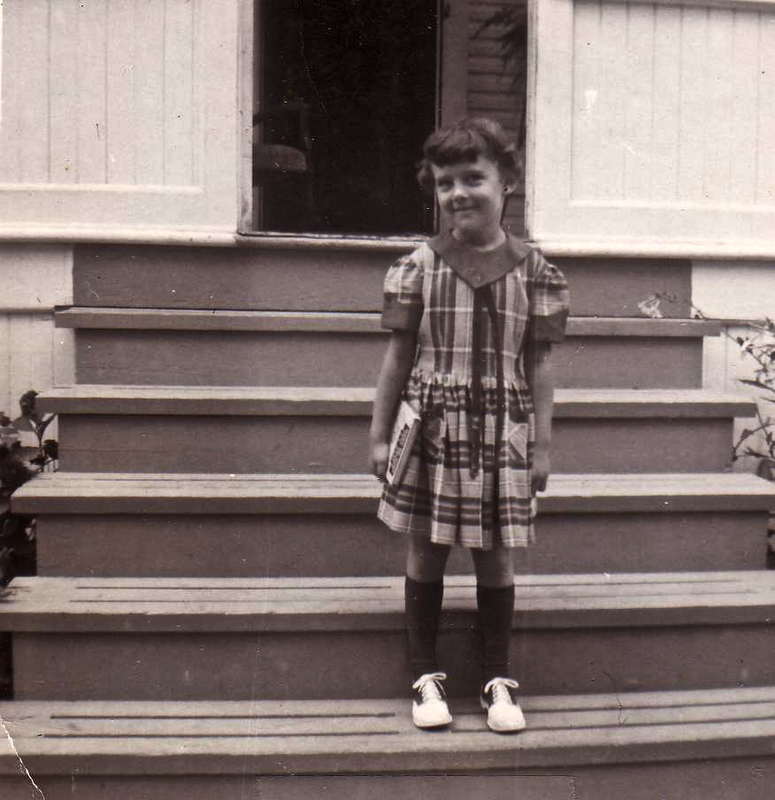 So what was a girl who loved to read and had no access to books in her home town to do? My reading salvation lay at the GoodWill store. 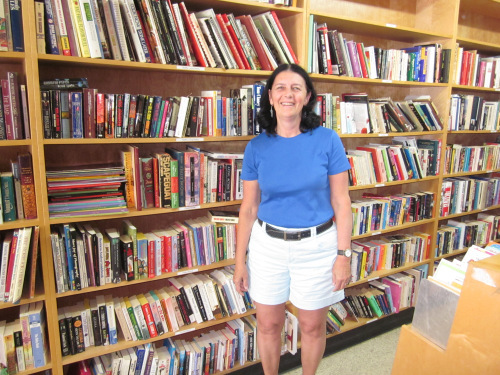 On trips to Winnipeg my Mom often made a stop at GoodWill and patiently waited while I picked out books to read. Books were 5 cents each. On my birthday my Grandma and Grandpa Peters always sent me a one dollar bill in my birthday card. That was 20 books! Should I choose a Nancy Drew, Cherry Ames, Box Car Children, Elsie Dinsmore, Bobbsey Twins, or another book in the Anne of Green Gables series or Little House series? I was in heaven in the GoodWill Store! All those books! 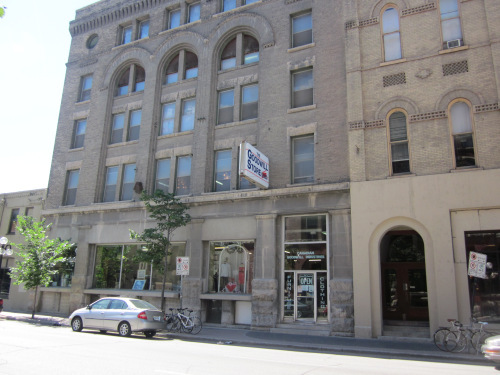 The GoodWill Store is still in the same location at 70 Princess Street as it was when I was a child. GoodWill was founded by a United Church minister Rev. J. Richmond Craig in 1931 as a way to provide employment to people who were out of work because of the depression. His slogan was “Junk into Jobs.” The store initially sold stuff left over from church rummage sales but expanded quickly. 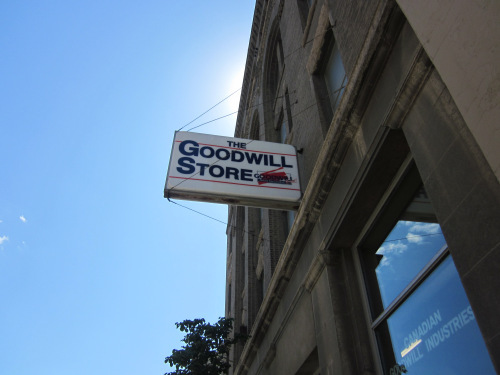 GoodWill continues to provide employment to people who find it difficult to obtain jobs. The GoodWill organization receives no government funding and every year they give their profits to worthy Manitoba causes. They now have 5 stores in Manitoba, four in Winnipeg and one in Ashern. The building at 70 Princess where I bought books was built in 1903 by the Bole Drug Company. Chemists manufactured their products in the building and they were shipped all across Canada. The Bole Building was one of the first to have speaking tubes that allowed the various departments in the building to communicate with one another. D.W. Bole who owned the company was a Winnipeg school trustee and a member of Parliament from 1904-1908. Pharmaceuticals continued to be produced in the building till 1932 and in 1934 Good Will which was in need of bigger premises took over. In the last 75 years GoodWill has given jobs to hundreds of men and women and provided them with more than $12 million in wages. They have helped to recycle and reuse millions of items that might otherwise have been thrown away. They also made one little girl hungry for books to read very happy and left her with magical memories of their store. 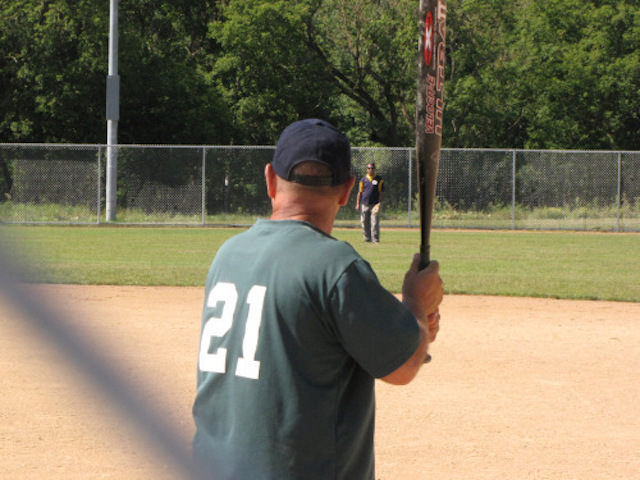 This weekend we were in Bemidji Minnesota because Dave was playing in a senior slow pitch baseball tournament for players in their 60th year and beyond. He plays with the Eastman team. 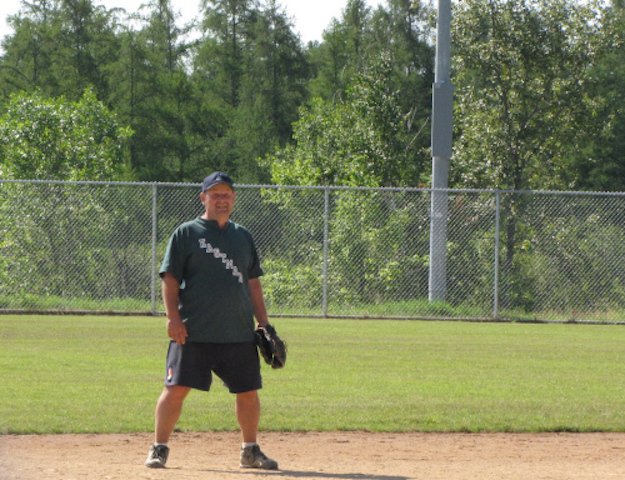 Dave alternated between playing third base………. The team did well, winning four games and losing two. 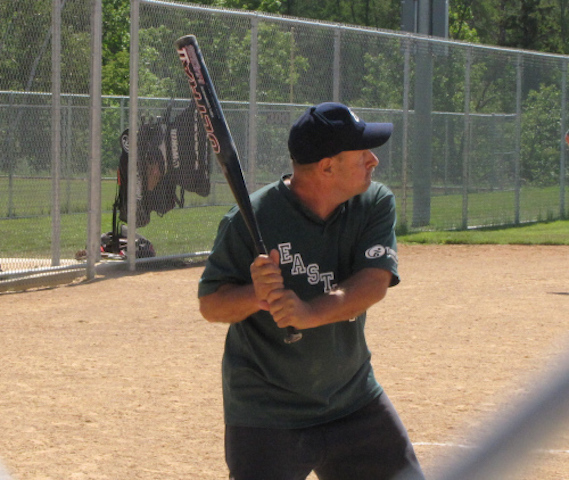 Dave had some very nice hits, although when he would hit a triple and had to run at top speed to third base you could tell his arthritic hip was talking to him. 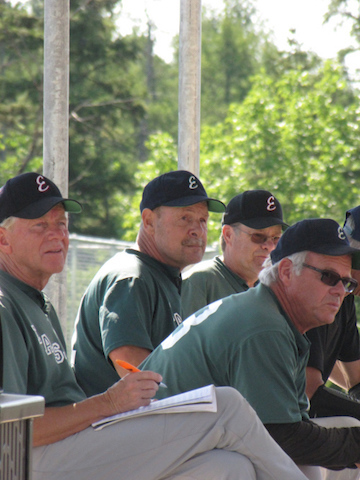 A number of the other players for Eastman were guys Dave had been on a variety of teams with thirty years ago when he was at the height of his ball career, playing senior mens fastball. The tournament gave me a great opportunity to visit with their wives, catching up with women I already knew and being introduced to some I hadn’t met before. Eric and Joyce, one of the players and his wife, had us all over to their campsite for a barbecue supper on Saturday night. The food was good as was the company. When we were crossing the border the customs officer was very interested in the fact that Dave was going to the USA to play ball. He asked him lots of questions about his team, the positions Dave played, and what Dave’s strengths were as a player. 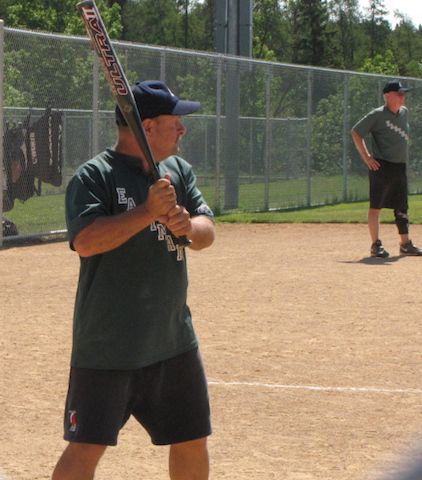 Dave told the officer he thought the team probably valued his bat the most. 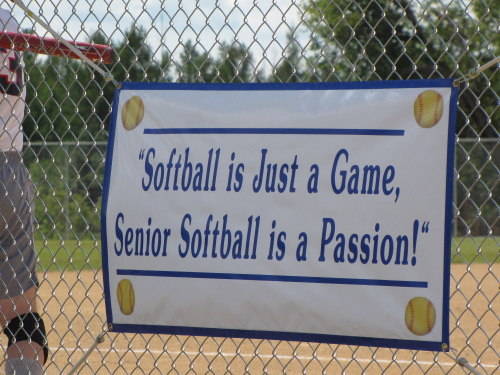 This sign summed up the feeling of many of the players. 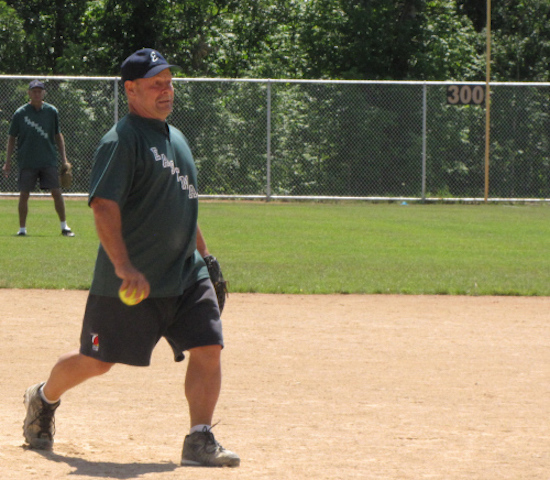 You have to be passionate about softball to still be playing the game when you are in your 60’s. On our way home today we stopped in Roseau Minnesota to play 18 holes of golf with friends Brian and Merle. Brian is also on the Eastman team. 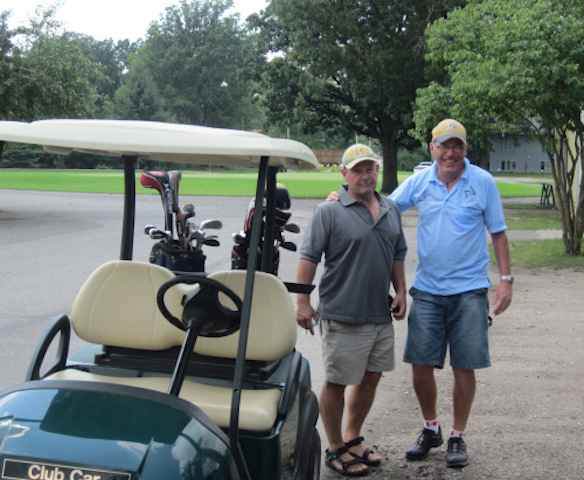 Although Merle and I walked the 18 hole course with our clubs, Dave and Brian opted to take a cart. They were tired after all those games of ball ! A young woman named Victoria who has spent her life in foster care begins working at a florist shop and tries to build a life for herself. She’s had only one positive foster care placement. It was with a woman named Elizabeth, a vineyard owner who taught her all about flowers during their fifteen months together. The book alternates between Victoria’s childhood and adulthood. As the plot of her adult life unfolds we gain a greater understanding of why she behaves as she does because we are also learning about her childhood. I loved the way Victoria could discern people’s personalities and needs and design flower arrangements that suited them. The descriptions of food are mouth-watering. Victoria’s friend Grant and her foster-mother Elizabeth are both great cooks. I learned about the language of flowers. Victoria doesn’t always find it easy to talk to people so she communicates with the language of flowers. 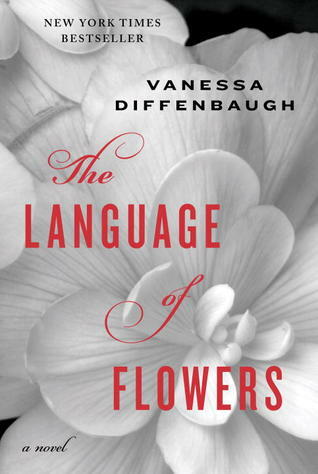 The language of flowers, sometimes called floriography, was used as a means of communication during the Victorian era. Flowers, which each had a special meaning were used to send coded messages. Sending someone a pink carnation for example, meant I will never forget you, a lily of the valley meant your happiness will return and a petunia your presence soothes me. What personal connections did I have? I taught many children who were in foster care during my teaching career. Some hid food to save for later just like Victoria did. Some were very angry just like Victoria was. Some couldn’t handle being in school which Elizabeth recognizes; and so she homeschooled Victoria. When I taught high school I came to realize that kids who had something they were passionate about had the best chance to be successful. I thought that perhaps our most important role as teachers was to help our students discover that passion if they hadn’t already done so. In this novel Victoria’s passion for flowers is truly her salvation. If you liked this post you might also like…………. I saw Picasso’s painting Guerncia when I visited the Renia Sofia Museum in Madrid and along with the high school students I was chaperoning tried to figure out what all the different images in the painting meant. I knew the painting was done to protest the bombing of the town of Guernica during the Spanish Civil War. On an April day in 1937 German and Italian planes rained bombs down on the city killing thousands. Picasso painted Guernica to commemorate that awful day but steadfastly refused to explain any of its imagery. He said viewers could take their own meaning from his canvas. I was hoping the play Guernica at the Winnipeg Fringe Festival would explain the painting in a way Picasso didn’t. I was disappointed. Although Picasso is the central figure in the drama you never actually see the painting, just a blank canvas and you don’t see him creating the painting as the advertising promises. The play takes us to Guernica on market day and in the city square we meet a young girl, a woman and her child, a prostitute, a vegetable seller and a man waiting for the birth of his first child. We get to know them during the course of the play and so when the bomb is dropped we feel bereft. When I got home I looked at Picasso’s Guernica online and tried hard to see if the characters in the play were depicted in the painting. I could find a mother and child, and a woman who might have been the prostitute, but couldn’t make any other connections. A flower and a matador’s cape have a role in the play and are in the painting. Those few connections were not enough to suit me. I wanted someone to tell me what the images in the painting meant, and why Picasso decided to paint the things he did, but I left the theatre with as many questions as I brought to the play. Other posts about the Winnipeg Fringe Festival……. On Walden Pond – Should We Make a Plan for the Future? 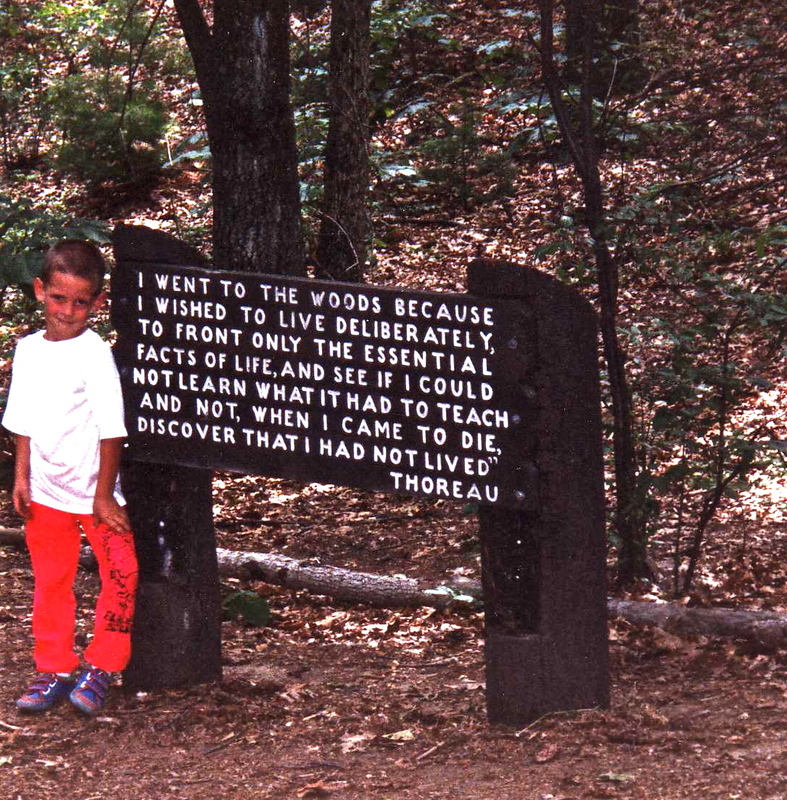 Our family visited Walden Pond near Boston Massachusetts many years ago. 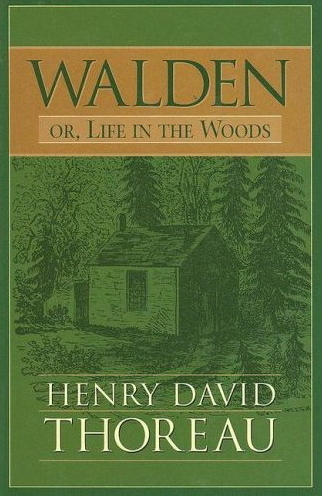 It is where the author and idealist Henry David Thoreau lived and wrote his book Walden- Life in the Woods. In 1845 Thoreau went into the woods and for over two years existed in almost complete solitude. 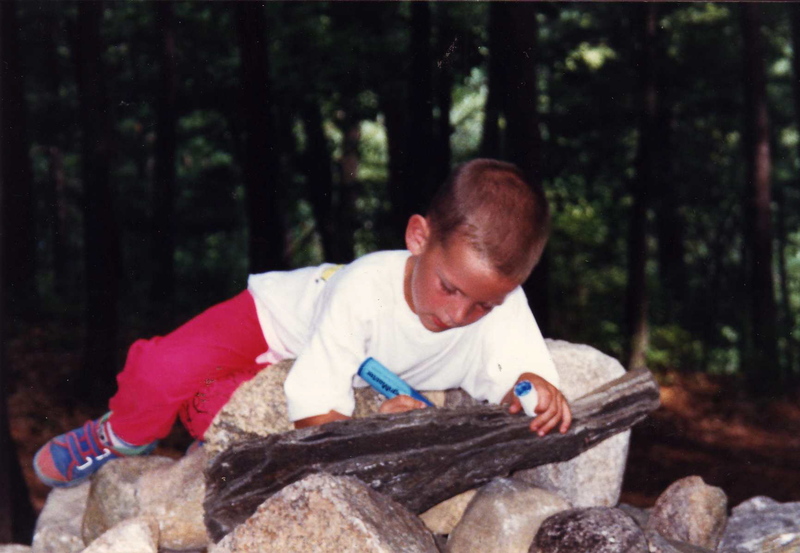 He wanted to simplify his lifestyle and become more in tune with nature. He kept a detailed journal and later this account of his experiences was published as a book. It is considered a classic piece of American literature. Today all that remains of Thoreau’s little cabin is a pile of rocks and a modest wooden sign with a quote from his book. Thoreau was motivated to go and live in the woods because he was worried about America’s future. He was dismayed by the growing commercialism he saw all around him and thought the only hope for his country lay in a return to a more basic lifestyle. A tradition amongst visitors to the Walden Pond site is to write their hopes for the future on one of the rocks on the pile where Thoreau’s cabin stood. Legend has it those wishes will be washed into Walden Pond by the rain and will eventually come true. 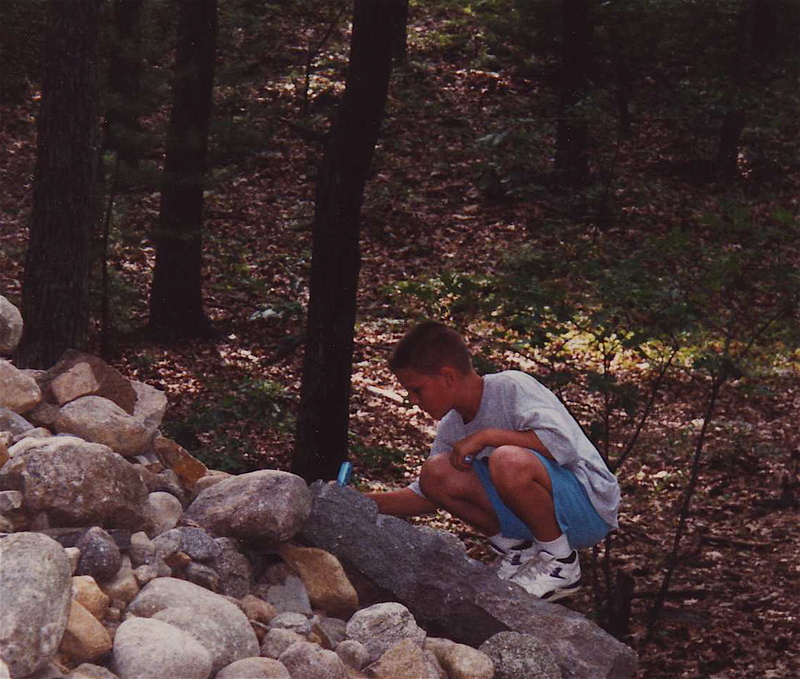 Each member of our family tried to imagine the future by writing our dreams and wishes on one of the Walden Pond rocks. Famous lifestyle coach Stephen Covey, who died last week ,advised us to ‘begin with the end in mind’ if we desired lives that had meaning and value. We decide what we want to achieve in the future and it helps us plan our present. I don’t know if I completely agree. I had trouble imagining my future at Walden Pond. What direction did I want my life to take? Did I really want to make a plan or set goals or would I rather life just unfold? My grandmother once told me that gypsies used to camp just outside the village where she grew up in Ukraine. If you gave them a watermelon they would tell you what the future held in store for you. Grandma told me she never gave the gypsies a watermelon because she had no desire to know her future. What a wise woman! That day at Walden Pond. I wrote some dreams on my rock. I have to admit that twenty years later the wishes I penned at Walden Pond still have not come true. The hopes I had for my future haven’t been realized but I’m really not disappointed. I think the future I’ve been granted has turned out to be every bit as good as the one I imagined that day at Walden Pond. Jesus said in the book of Matthew that we should let ‘tomorrow’- the future- take care of itself. What a wise man! Chasing Windmills is by Catherine Ryan Hyde. She is the author of the popular novel Pay It Forward, that became a mega movie hit. Like the characters in Pay It Forward who face a myriad of difficult life challenges, the male and female protagonists in Chasing Windmills are trapped in rather bleak existences. Life has been tough for seventeen year old Sebastian, kept in virtual exile by a controlling father and for Maria, a twenty-two year old who is constantly trying to pacify Carl, her abusive partner. Trevor, the hero of Pay It Forward must find a way to deal with bullies. Both Sebastian and Maria must also confront the bullies in their lives. The phrase ’tilting at windmills’ comes from the book Don Quixote written in the early 1600’s by Cervantes. It means ‘attacking invisible enemies.’ Don Quixote bravely fights windmills he imagines to be giants. Although this book is called Chasing Windmills and not Tilting Windmills the allusion to Cervantes’ hero seems obvious. Both Sebastian and Maria, the two main characters in Chasing Windmills have their own giants to slay if they want to change their lives. Breaking away from their fears and being brave enough to take a chance on new relationships makes it possible for them to alter futures that would appear to be set in stone. 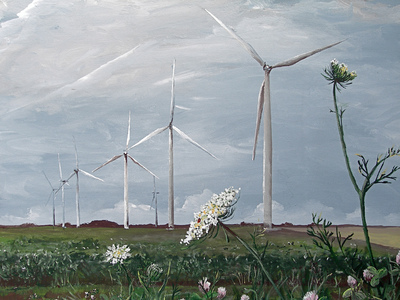 The book reminded me of this painting by my husband’s cousin Ruth Driedger, which shows modern windmills. People often think these steel wind machines mar the landscape but in Ruth’s painting they have a beauty all their own. Sebastian, the main character in Chasing Windmills remembers seeing these kinds of windmills near his maternal grandmother’s home when he was a little boy. His father has cut off his contact with Sebastian’s Grandma Annie but the image of those beautiful windmills has stayed with Sebastian and conjure up warm feelings that inspire him to try to reconnect with his mother’s family. 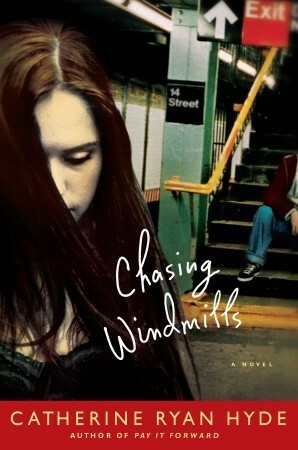 Maria the female protagonist in Chasing Windmills is named after the main character in West Side Story. That story of ‘love at first sight’ definitely influences Maria. She feels a strong connection to Sebastian the first time she sees him, just like Maria did the first time she saw Tony in West Side Story. Sebastian’s friend Delilah gives him the play Romeo and Juliet to read after he watches West Side Story. Delilah tells him the Broadway musical his friend Maria loves is based on Shakespeare’s play. Sebastian’s Dad doesn’t believe in love so while he has introduced Sebastian to Shakespeare he hasn’t let him read Romeo and Juliet. 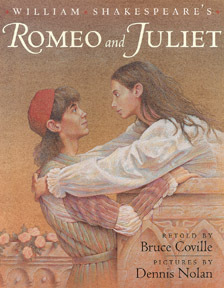 There are comparisons between the star-crossed lovers in Romeo and Juliet and West Side Story and the love Maria and Sebastian share, but there are also important differences. A subway ride is a pivotal event in the 1998 movie Sliding Doors just as it is in Chasing Windmills, since the two main characters Maria and Sebastian meet while riding the subway. 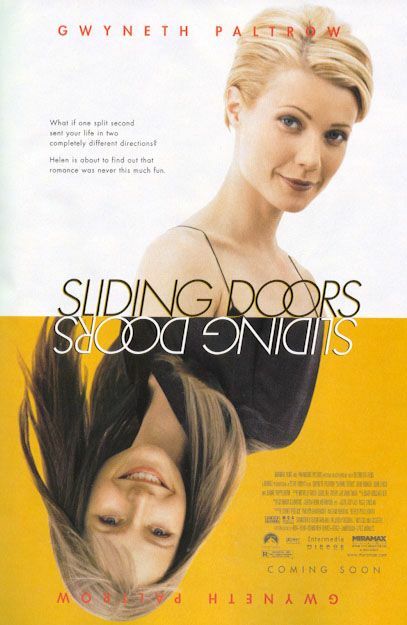 Sliding Doors describes two parallel universes and for much of this book the story is told from the point of view of the two parallel universes inhabited by Maria and Sebastian. Sliding Doors examines how much control the individual has over their future as does Chasing Windmills. This book was an inspiring, hopeful read and made me do some serious thinking about my own life and attitudes. The main characters are almost unbelievably naive and the minor characters very stock and stereotypical. The plot is a bit too predictable save for the ending, and the parallels between the alternating narrators a bit too closely drawn. It was a good summer read however and I got up early this morning and skipped my work out at the gym to finish it. How’s that for a recommendation? If you enjoyed this post you might also like…………. I’ve been to my second trio of plays at the Winnipeg Fringe Festival now. I went to see The Tempest because of personal connections. I got to know my husband while working on a group project about the play in my first year English class at university. I saw the play at London’s Globe Theatre in 2005 and went to Winnipeg’s Shakespeare in the Ruins production in 2001. I was especially interested in the Fringe Festival show because it was put on by young people. When I taught grade four in Mitchell, Manitoba I staged The Tempest with my students several years in a row using a simplified script I had written. When Bev Ridd, who I work with on a Project Peacemakers committee, sent an e-mail saying her grandsons were playing the roles of Caliban and Prospero in the Fringe production I decided to go. I greatly admired the young actors. They had put so much work into learning their parts and performed with passion. The sets and costumes were great! However I thought the production was far too long, running almost 90 minutes. Especially since it was billed as a play for children it should have been no longer than 45 or 50 minutes. Several young families walked out before the end. The advertising does say babes in arms are welcome, but during the show I attended, a baby started crying and didn’t stop. It took a long time before the parent decided to exit the theatre with their wailing infant and I felt sorry for the young actors who had to soldier on despite the fact the audience was mightily distracted. I thought it was wonderful that the performers had mastered all that Shakespearean language so flawlessly and executed their lines with a dramatic flair that made it evident they knew exactly what they were talking about. However I’m not sure the audience always did. I think some adaptation to a more modern English would have gone a long way to engage the children watching the show. I’d give this production a 2.5 out of 5. The actors in Teaching Hamlet are professional and with the exception of a unecessarily long and supposedly funny opening scene where Joe, played by Keir Cutler is trying to set up a video camera; the pacing was great and kept the audience’s attention. The title is misleading, because except for quoting Hamlet several times, the play isn’t about Hamlet at all. It is about a lonely man named Joe who heads up a society he and his mother founded, that is trying to promote the idea the Earl of Oxford and not William Shakespeare wrote the bard’s plays. Joe enlists a mercenary actor named Conner Hamilton to help make a video to promote his ideas. The show is really about getting a glimpse into the lives of the two main characters and finding out what kind of people they are. We watch them develop some empathy for one another. Ultimately that is why the show is satisfying because it reminds us how many truly lonely people there are in the world and encourages us to reach out to those around us. It prods us to see beyond people’s outer facade and to realize we may have something in common with men and women who appear very different from us. I’d give this play a 4 out of 5. The fact this show is in the Prairie Theatre Exchange’s comfortable venue adds to the viewer’s enjoyment. Veryalyn Warkentin’s play Mary and Martha has not received good reviews but I went to see it anyway with my friend Wendy, because I had personal connections with the story. It is about Mennonite young women who came to Winnipeg from rural Manitoba to work as housemaids in the homes of wealthy city folks in order to earn money to pay back their families’ travel debts following their immigration to Canada from Ukraine. This happened all over Canada in the 1930’s and 40’s. My mother-in-law Anne worked for a wealthy family in Leamington, Ontario. The Mennonite Church established homes in several Canadian cities called Maedchenheims (girls homes) as a clearing house and refuge for young Mennonite women working in the city. I once did a feature story on five women who were ‘city girls’ in their youth. This last year I also read Dora Dueck’s book This Hidden Thing which tells the story of one of the Mennonite ‘city girls.’ I enjoyed Mary and Martha because of my personal interest in its story although I thought some of the actors seemed to slip in and out of their accents and they did too much explaining and informing and not enough acting. The lengthy family memory the main character Helen Epp shares at the end of the play had me in tears, because I have heard almost identical stories from my grandparents and my husband’s grandparents, but audience members without that kind of personal connection probably found it too long and somewhat disconnected from the plot of the play. I’d give Mary and Martha a 3.5 out of 5. I already have tickets for another trio of plays so look for at least one more blog post about the Fringe Festival. If you enjoyed this blog post you might like……….